According to the nonpartisan think tank Pew Research, about 690,000 people are enrolled in DACA. And since its inception in 2012, nearly 790,000 immigrants have received protections under the program. 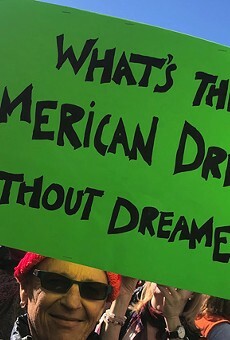 Backed by Democrats, the 2017 Dream Act was introduced in the House of Representatives in July 2017. If passed, the bill would provide a clear path to citizenship for undocumented youth who are now vulnerable to deportations without DACA. But the bill has failed to gain traction in the GOP-controlled Congress. However, young activists like Prieto, Diaz, and others say the latest Dream Act doesn't go far enough. And they're worried that if Democrats strike a deal with Trump, it'll include provisions that could hurt the immigrant community — such as a border wall between the United States and Mexico, increased border security, detention centers, and more. And they have reason to be concerned: Democratic Senate Minority Leader Chuck Schumer said last Friday that he had reached a tentative pact with Trump to include the border wall in a deal on DACA but that the president later reversed course and demanded even tougher immigration measures. The urgent need for comprehensive reform can be seen through the recent detainment of Luis Mora, an undocumented UC Berkeley student. Mora was visiting his girlfriend in San Diego on Dec. 30, and as they were driving home, he missed a turn and came across a Customs and Border Patrol immigration checkpoint in Jamul, Calif. He told the officer he was undocumented and was immediately detained. He was held in custody at the Otay Mesa Detention Center until Jan. 17 when ICE released him on a $1,500 bond. Mora returned to the East Bay on Jan. 21. He came to the U.S. in 2009 from Colombia when he was 11 years old. Since the DACA program was only open to those who have been in the U.S. since June 15, 2007, Mora didn't qualify for it — though he would have qualified for past versions of the Dream Act currently stuck in Congress, according to the Undocumented Student Program (USP) at Cal. Immediately, Mora's detainment sparked an uproar among immigrant rights groups in Berkeley and the East Bay. RISE, CIYJA, and the USP began an online campaign to mobilize and inform more people about it. Using the hashtag "FreeLuis," they pressured California Sens. Kamala Harris and Dianne Feinstein, along with Pelosi, Gov. Jerry Brown, and UC Berkeley Chancellor Carol Christ, to make a statement on Mora's detainment. On Jan. 5, the group tweeted that Harris, Feinstein, and Rep. Barbara Lee, D-Oakland, reached out to express support for their campaign. Three days later, Christ released a statement on the issue saying she had also been in touch with student activists. However, RISE members published a response on their Facebook page stating that they haven't heard any direct messages from Christ. Prieto sees Mora's case as an opportunity to pressure Congress into action. He said he strongly believes they can affect legislation, but to do so, they're going to have to mobilize. "We have the momentum," he said. "How can we use this tragedy of detention to resolve this not just for him but for all undocumented people?" That's why their version of the bill is being called a "Clean Dream Act" — it's not only about protecting young DACA recipients from deportation but also about protecting and acknowledging the contributions of all 11 million undocumented immigrants, said Yaquelin Lombera, who is in the process of starting a Richmond chapter of the national immigrant rights' organization Movimiento Cosecha. "This isn't just about a document," Lombera said. "It's about getting treated with dignity and respect. The country can't operate without immigrants." Born in Mexicali, Mexico, Juan Prieto made it to the United States as a young child of eight, along with his Salvadoran father, Mexican mother, and three siblings. Since arriving at UC Berkeley, Prieto has been a loud and active protester of the current and previous administrations' immigration policies. During his speech at the Richmond detention center, the 25-year-old described an encounter with police while he was a young boy in Mexicali after his uncles had gotten involved in drugs. The police barged into their home, pointing guns at Prieto and his mother as they lay face down on the floor, he said. His voice softened as he shared this story. He focused on the ground, eyes half-closed, as if the memory was still too painful. "They treated us like we weren't human beings," he said during a later interview. "That's when our home was violated." After that night, they left for the United States. Prieto crossed the border using someone else's papers. His parents told him they were going to a cousin's birthday party. While he was too young to fully grasp the implications, he could tell that something was off: His parents were devastated, and he knew they had to hide it from his grandfather, who they were leaving behind. So, he pretended to be asleep and didn't ask any questions. He referenced this moment at the protest. His grandfather had recently died, and the pain of leaving him behind years ago has haunted his mother. Before her father's death, she was living about 50 minutes away from him, just across the border in El Centro, Calif. But returning to Mexico to attend his funeral was not an option, because she might never get back. Prieto described how his mother stared out her window toward Mexico as her father was being buried.